Uber is adding bike racks to the back of its cars in Seattle beginning tomorrow. Now when you get tired or it starts raining while you’re riding your bike, Uber will give you and your bike a ride home. For a price. 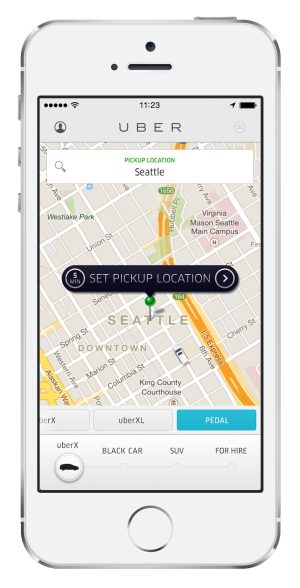 The Uber app in Seattle will now include a Pedal button along the with the Uber, UberX, and UberXL options. Tap the button and an UberX with a bike rack will pick you up. Unfortunately, shoving your bike on the rack will cost you an extra $5 in addition to your regular fare. But, the cars are equipped with Saris’ racks that fit two bikes so maybe you can bring along a friend and split the cost.